A medium-sized gun dog that is affectionate and eager to please, the English springer spaniel was the foundation stock for several other spaniel breeds, including the clumber, Welsh, Irish water and field spaniels. However, the breed it is most closely related to is the English cocker spaniel. 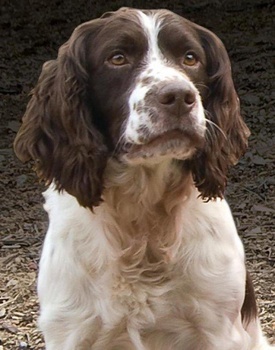 At one time, both springers and cockers were born in the same litter, the main difference being size – larger springers were used to flush (or “spring”) and retrieve all manner of game birds while the smaller cockers were used primarily for woodcock hunting (both breed names were derived from their hunting styles). As the two breeds developed, the differences became more pronounced, and in 1902 the springer was recognized as its own breed in England and in America in 1910. The breed standard dictates that springers stand approximately 20 inches in height and weigh between 40 and 50 pounds. As with many breeds, a split has occurred that has created differences in those dogs used for working in the field and those shown in the conformation ring. This split is perhaps the most evident of all breeds and has been evident for at least 70 years. Working field dogs tend to be smaller, lighter dogs (both in weight and bone) that possess the athleticism and endurance required for hunting miles of heavy terrain. They also tend to have a shorter, coarser coat than their conformation counterparts who possess long, silky coats with lots of feathering on the legs and docked tail. The show lines also tend to have longer, more pendulant ears, and more pronounced dewlaps and flews. Regardless of working status, springers come in a couple of coat colors, the most popular being liver and white or black and white. Not as common, but accepted by the AKC, are blue or liver roan and tricolor – black and white or liver and white with tan markings, usually found on eyebrows, cheeks, inside of ears and under the tail. The working English springer spaniel possesses a keen nose and working ability. They have the drive to quarter through heavy upland cover in search of pheasants, quail, chukar, partridge, among other birds. With their webbed feet and thick coat, they’re capable swimmers, which make them an ideal dual-purpose field dog – they can hunt both the upland fields and the retrieve shot waterfowl from cold winter waters. Their intelligence (ranked as the 13th most-intelligent dog by Stanley Coren), disposition, loyalty, affection and willingness to please has made springers a popular choice for not just hunters and conformation competitors, but also as family dogs (they were the 29th most-registered dog in 2012). They are also popular choices as detection, sniffer and search and rescue dogs around the world. As smaller medium-sized dogs, springers enjoy a lifespan of 12 to 14 years of age. Springers are susceptible to hip dysplasia, eye and metabolic issues, as well as neurologic-system problems. All sires and dams should be screened prior to breeding to ensure these diseases aren’t passed along to offspring. At Paw Print Genetics, we offer a panel test that screens English springer spaniels for four known genetic issues, including degenerative myelopathy, glycogen storage disease VII (Group B), Familial nephropathy (Group B) and progressive retinal atrophy, cone-rod dystrophy 4.